A court proceeding against Taiwan's former President Chen Shui-bian has been suspended after he asked to be taken to hospital. Mr Chen told the judges he needed treatment after being pushed earlier in the day, opposition lawmaker Lai Ching-teh told reporters. Earlier, Mr Chen was detained by prosecutors questioning him over corruption charges. The charges relate to his eight years in office, which ended in May. He is accused of money laundering and illegally using a special presidential fund. He denies any wrongdoing, and accuses the new administration of persecuting him to bow to the wishes of Beijing. Mr Chen is an ardent supporter of Taiwanese independence, and a trenchant critic of President Ma Ying-jeou's Kuomintang (KMT) administration, which he accuses of pandering to Beijing. 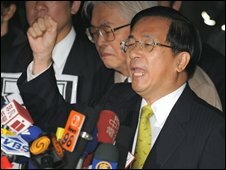 His detention comes days after a historic visit to the island by a senior Chinese envoy was marred by violent protests. The former leader was in court for a hearing to decide whether his detention earlier in the day by prosecutors should be formally approved. But the hearing was suspended when Mr Chen demanded to be taken to hospital, Mr Lai said. "The former president told the judges that he was pushed from behind while being escorted out of the prosecutors' office, and demanded that he be sent to the National Taiwan University Hospital to examine his injuries," Mr Lai told reporters, according to the AFP news agency. "The judges have taken seriously the former president's complaints and decided to suspend the hearing," Mr Lai said. There were no more details on the type of injury Mr Chen may have sustained. Earlier on Tuesday, Mr Chen had spent more than six hours in the prosecutors' office answering questions about corruption before he was dramatically handcuffed and led to a waiting car. As he was led out, he put his handcuffed hands in the air and shouted "political persecution" to an audience of dozens of protesting supporters. "The KMT and the Chinese Communist Party see me as their number one prisoner as I am the biggest stone blocking their way to reunification," Mr Chen reportedly said. He said the Chinese envoy, Chen Yunlin, "had a bad time in Taiwan... so Ma Ying-jeou wants to put me in jail as a sacrifice to appease China. I am very honoured and proud to play such a role." Mr Chen and his family have been mired in corruption allegations since 2006, when his son-in-law was charged with insider trading on the stock market and then jailed for seven years. The former president is under investigation for allegedly embezzling 14.8 million Taiwan dollars (US$480,500; £306,000) from the government. The charges have damaged the reputation of the main opposition Democratic Progressive Party (DPP), observers say, which now faces a rough ride in local elections next year. Taiwan has been ruled separately since the end of the Chinese civil war in 1949; the defeated Kuomintang retreated to Taiwan to create a self-governing entity. But Beijing sees the island as a breakaway province which should be reunified with the mainland, by force if necessary.